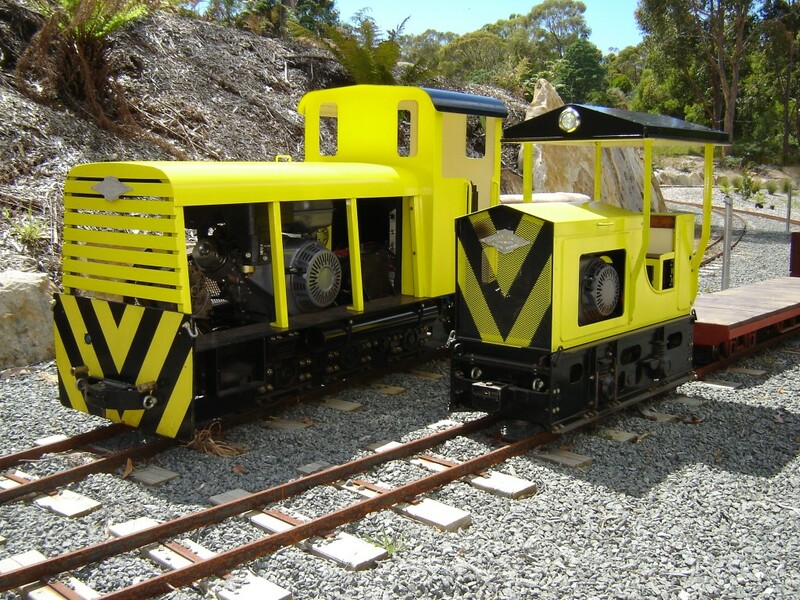 The Boulder Creek Tramway is a private 71/4" (184mm) gauge miniature bush railway that is currently under construction at Howden, approximately 15 minutes south of Hobart in Tasmania. The completed railway will consist of approximately 1200 metres of track with a full lap being around 1.6 km long. Featuring a 22 metre long tunnel and several bridges, the steep and winding track resembles that of a narrow gauge bush tramway hence the name "Boulder Creek Tramway". Due to the lay of the land, a conventional circuit or loop track is not possible therefore the track is of a point to point design with a reversing loop at each end to allow continuous running. Several stations and passing loops are situated along the length of the track and eventually some form of signalling is to be installed to allow safe running. See track plan. The idea of the Boulder Creek Tramway is to resemble a 1/3rd scale miniature of a typical two foot gauge Australian bush railway / tramway in the transition era between steam and internal combustion forms of motive power. That being said, anything that is built to 71/4" gauge gauge is welcome to run here and regular running days are now held once a month. The facilities for loading and unloading are to be constructed along with a suitable storage shed for locos and rolling stock. Construction so far has seen the laying of approximately 950 metres of track including 19 sets of points, the construction of the tunnel, the bridge crossing the dry creek bed of "Boulder Creek", and the trestle bridge on the lower section of the track. of the track at the "Boulder Creek Tramway" Nov. 2011. All locos are petrol/electric drive using a modified alternator to power an electric traction motor. Details on using alternators to power traction motors can be read here. Several other locos are permanent residents on the Boulder Creek Tramway and pictures of some of these can be seen in the Out and About on the BCT gallery page. Now viewing: 1 Text and photos Copyright © 2008-2019 Dave Webb, All rights reserved.